Create a window called winMenus, and create as many of the following components as you have time for! 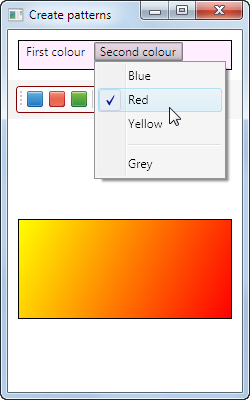 The first menu gives you a choice of colours for the first linear gradient stop (you might want to leave making the checking of menu items mutually exclusive until the end, as this is tricky). See below for how the second menu works. Here we've chosen a red colour for the second half of the linear gradient brush. 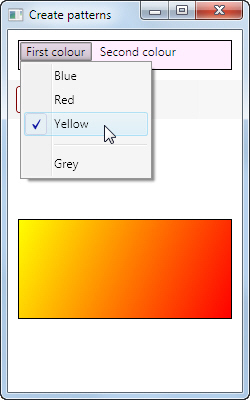 If you click on a tool, it makes every gradient stop the same colour. Still bored? 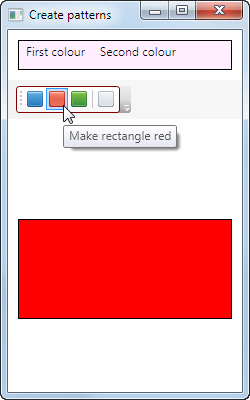 You could add a right-mouse button menu (context menu) for the rectangle (this isn't, however, included in the answer - you may not be bored ...).